Thank you so much to our friends and fans who make what we do for a living worthwhile! 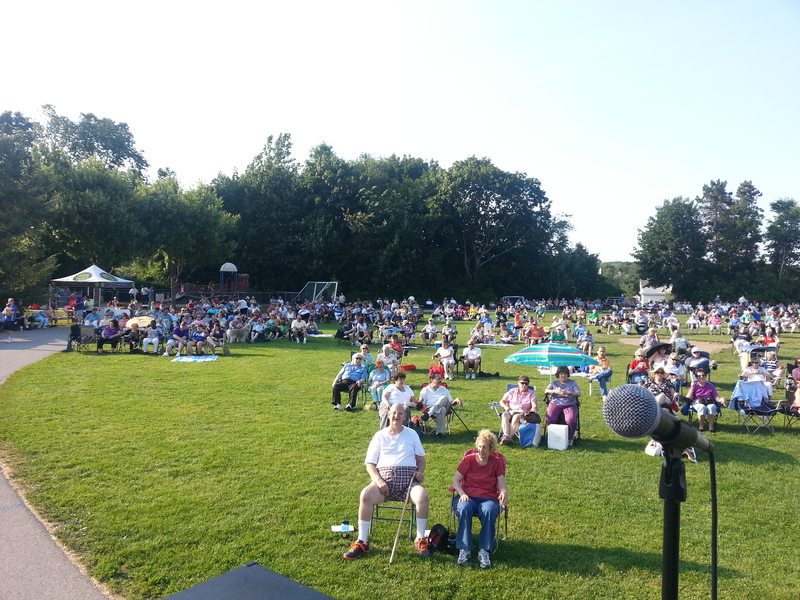 We had such a great time seeing each one of you! 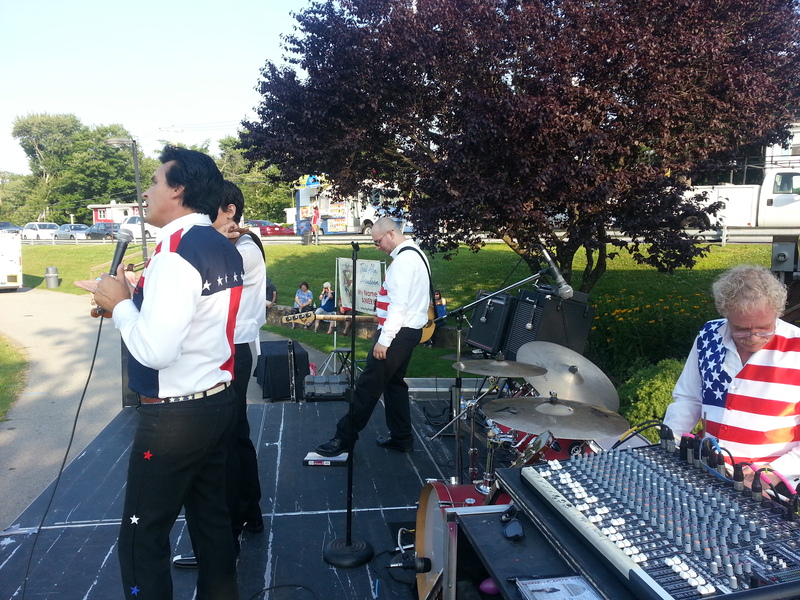 June 29 we started out in Yorktown Heights, New York. 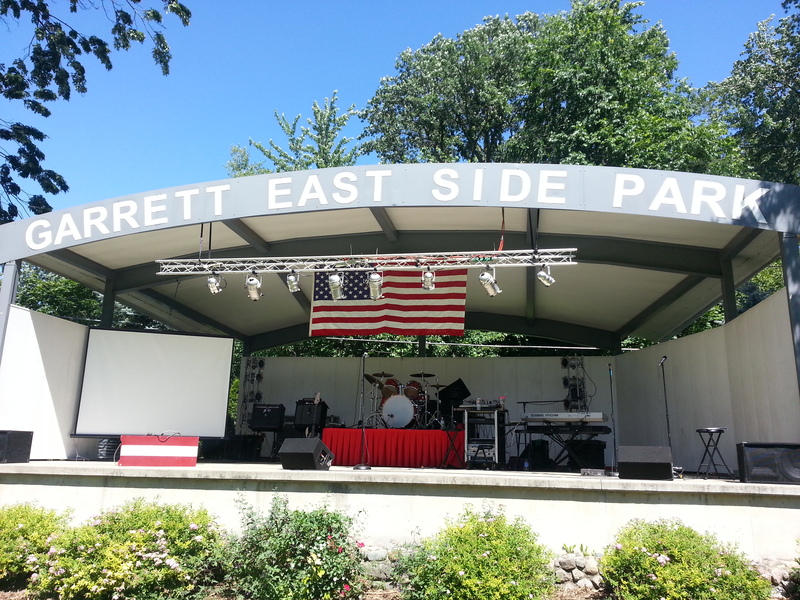 We brought our Tribute to the Legends concert to their outdoor concert series. Our first time there, but certainly not our last! It was great to see one of Todd’s grade school friends! We hope to come back. We are going to have photos below from all along the way. 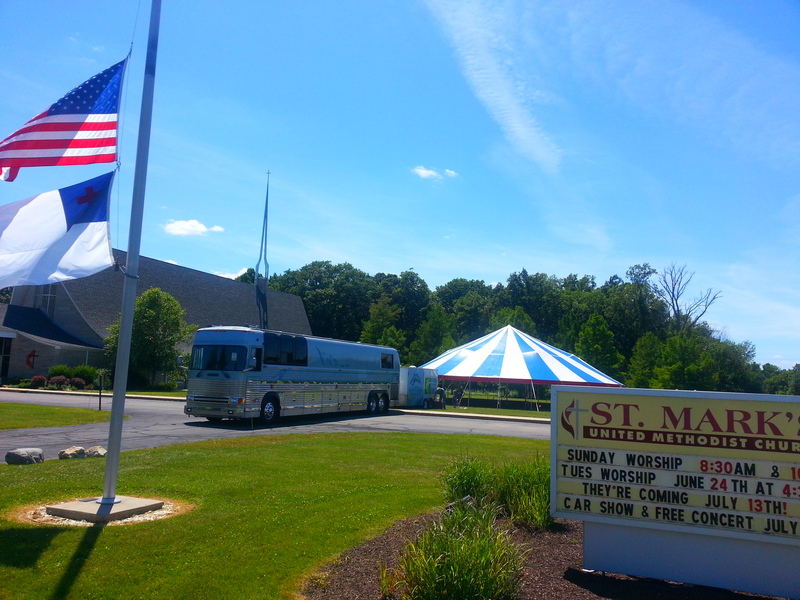 We headed to Bryan, Ohio from there for a two day God and Country Tent Revival of America concert event! Todd actually flew every single day that week. He had to be at Holiday Inn Resort in Panama City Beach, FL on Monday, Wednesday and Friday of that week and on Tuesday, Thursday and Saturday we had concerts in Ohio and Indiana! The band stayed up north while Todd flew back to Florida. Hey, you gotta do what you gotta do while you can do it 🙂 It all worked out great. 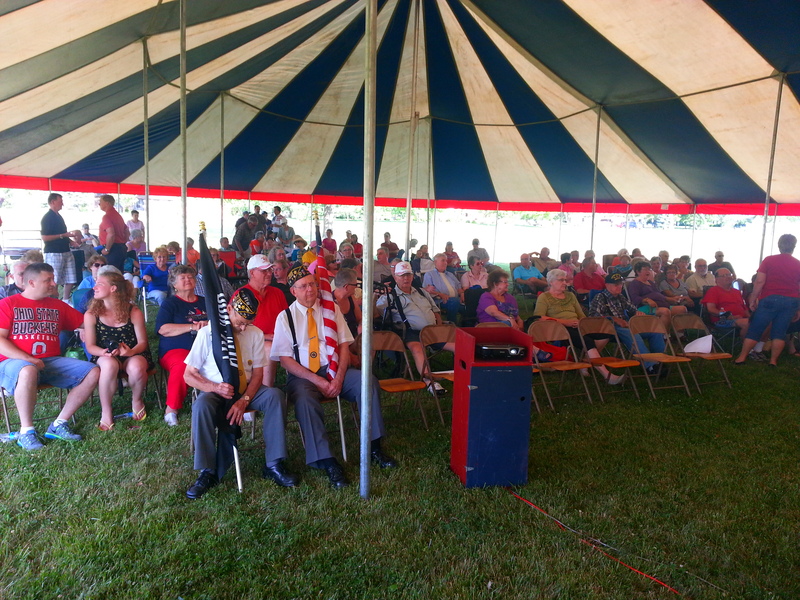 Tuesday July 1 we held our God and Country Tent Revival of America Honoring Veterans. 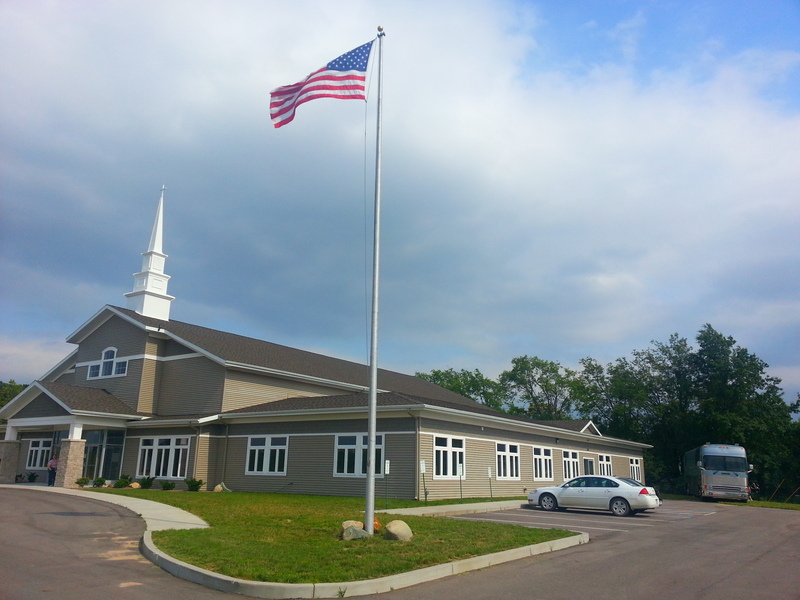 Thank you to the Wesley United Methodist Church and the First Assembly of God for joining together and hosting the events! 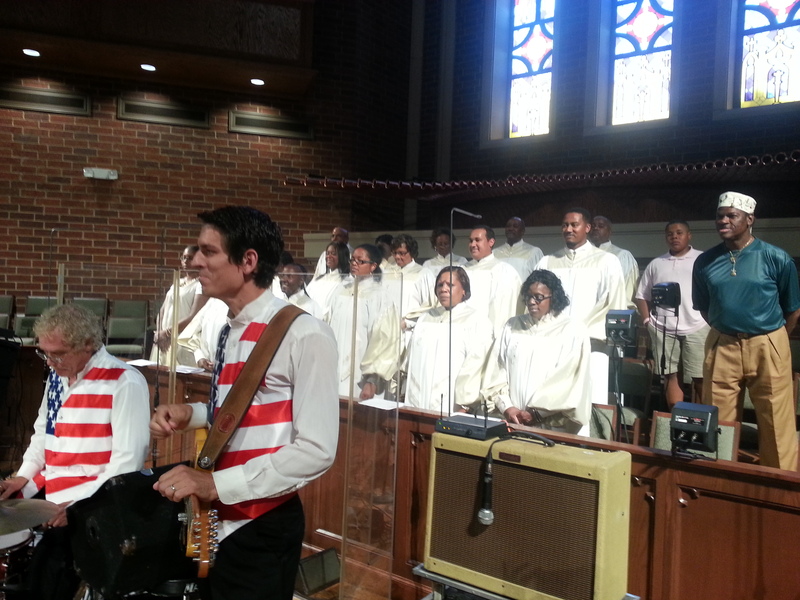 It is so good to see different churches work together! That is what we are all about, uniting Americans for a greater cause. Wednesday night Bluegrass gospel group New Outlook joined us under the tent for some more great gospel music. Thank you to them also! 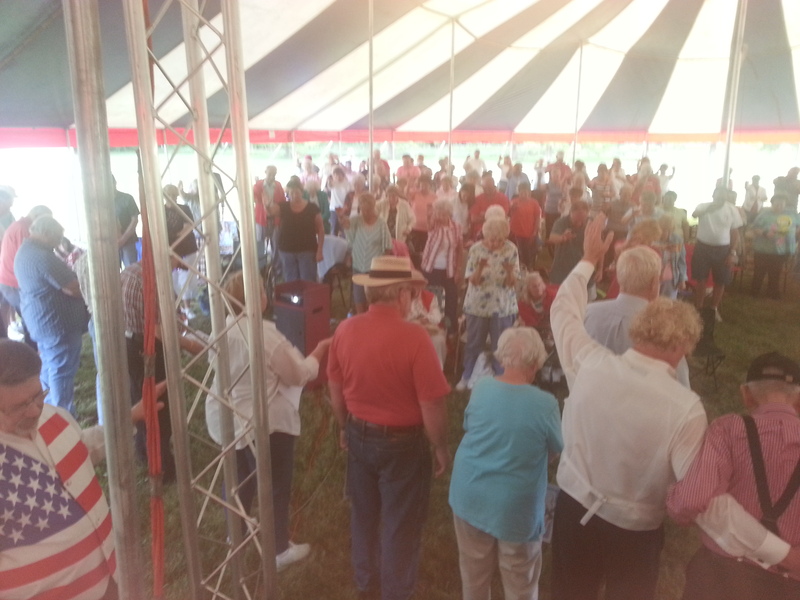 Saturday July 5 St. Mark’s United Methodist church in Deactur, IN, hosted God and Country Tent Revival of America under the tent! It is always so touching to honor the veterans with our special certificates and to pray for them. We also got to visit a sweet little girl named Ebony who was fighting cancer with all of her might and Faith! She was determined to come to the event but was too weak. We visited her at her house before the concert. 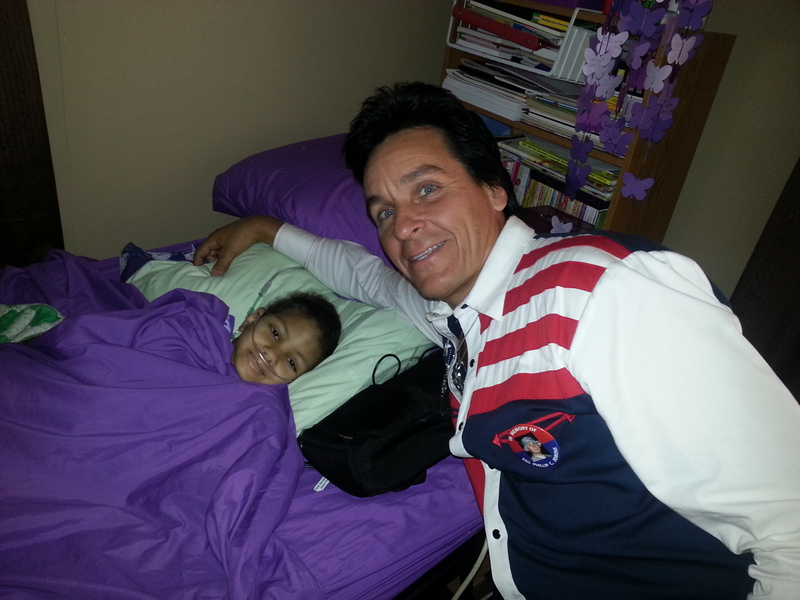 Three days later she lost her battle but went straight home to Jesus, healed and whole! We are so thankful we got got to see her! Keep her mom and family in your prayers please. 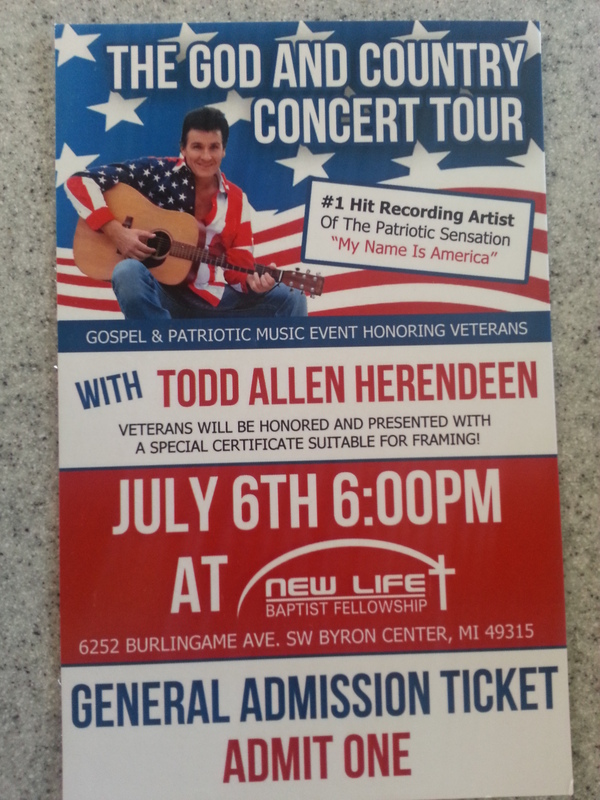 Sunday July 6 we headed to Byron Center, Michigan to the New Life Baptist Fellowship Church who hosted our God and Country Concert Honoring Veterans, inside the church. 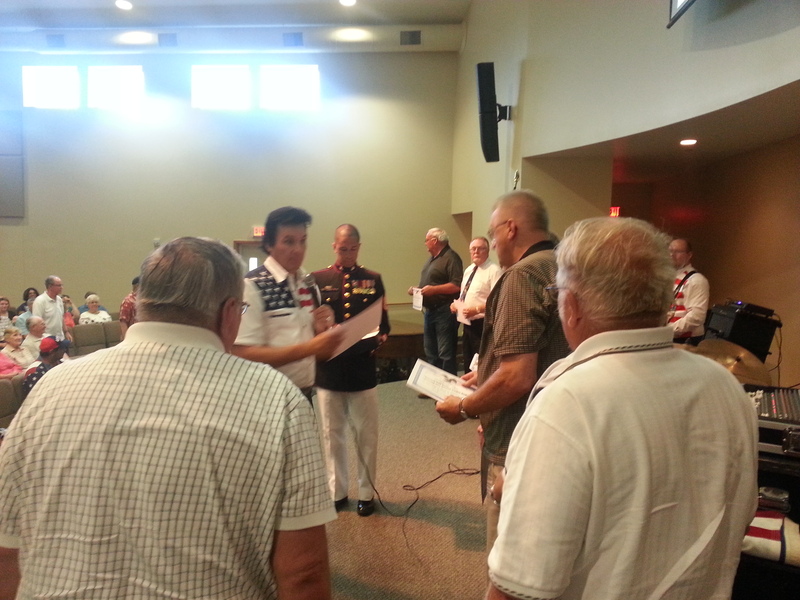 Honored to have a Marine help hand out certificates to honor the veterans there! We were also blessed and protected because they told us the next day that an hour after we left a tornado touched down right beside the church but did not do any damage to the church! We did get in any of that bad weather! God is good! We headed back to Panama City Beach for our Monday night show at the Holiday Inn Resort (BIG thank you to our bus driver Kary for all the help on this trip!!) 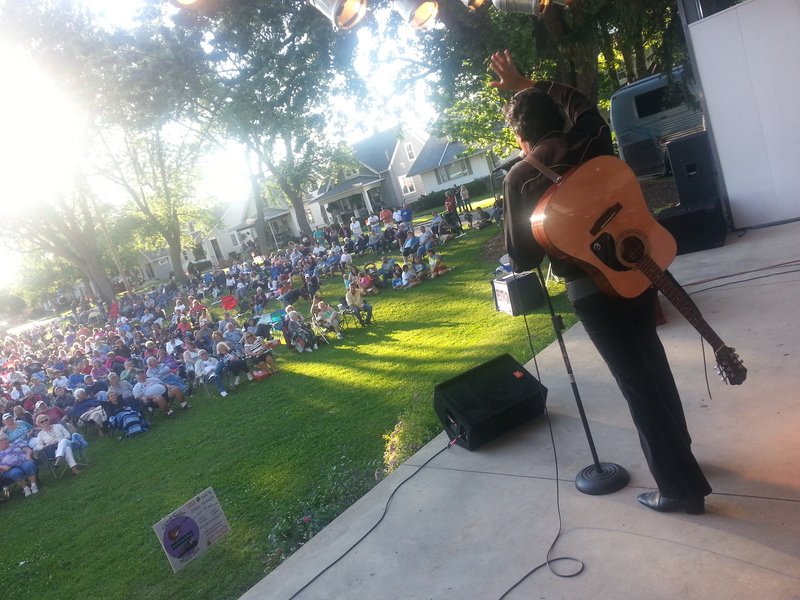 And on Tuesday July 8 we did a super fun show in Sapphire Valley, North Carolina at the slopes of the ski resort for their summer concert series. We hope to come back again! Beautiful area! Back to the beach for 3 shows and then we headed south to Summerfield, Florida for a Concerned Veterans For America Event on July 12. 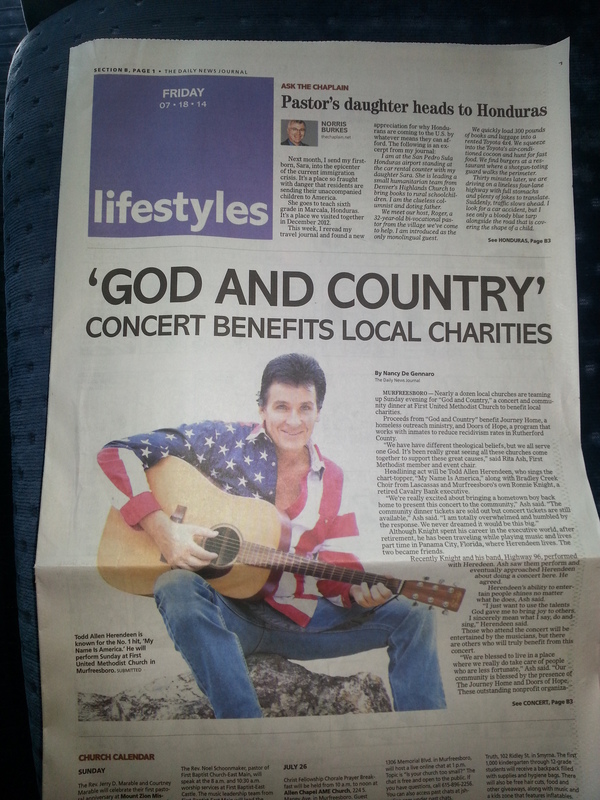 July 20 we were in Murfreesboro, Tennessee for a big God and Country Concert Honoring Veterans hosted by the First United Methodist Church. We want to thank you fans and friends who joined us at this event because you raised around $20,000 for two local charities; the Journey Home and Doors of Hope. We had the Bradley Creek Choir join us the entire night and sing along with us! 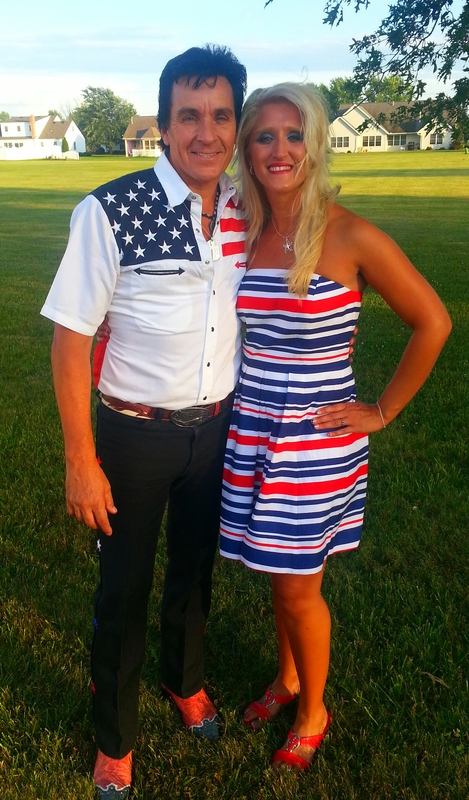 And of course Mr. Ronnie Knight, bass singer from Murfreesboro. 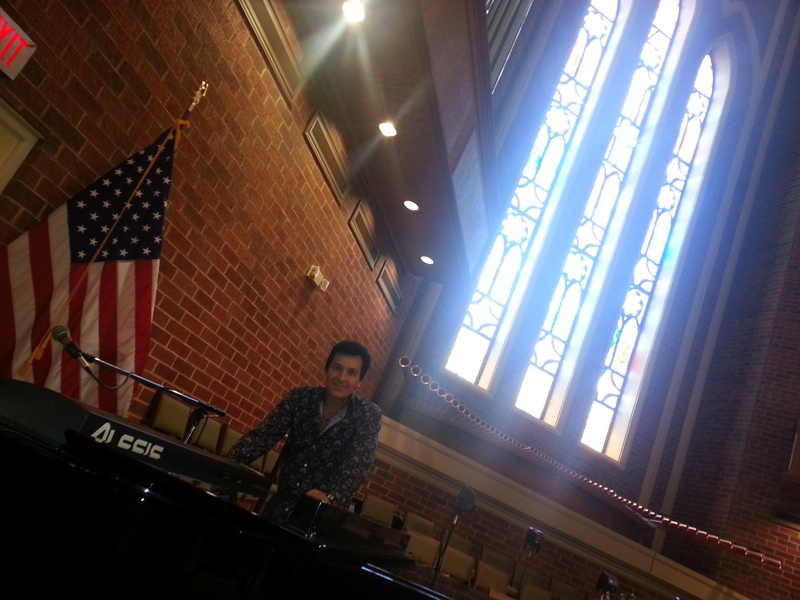 As many of you know, he has been singing with us for some time now at many of our concerts! We are blessed to have him. This event was a fantastic fun night! Billy Mason, who drummed for Tim McGraw or 18 years even came out to see us! 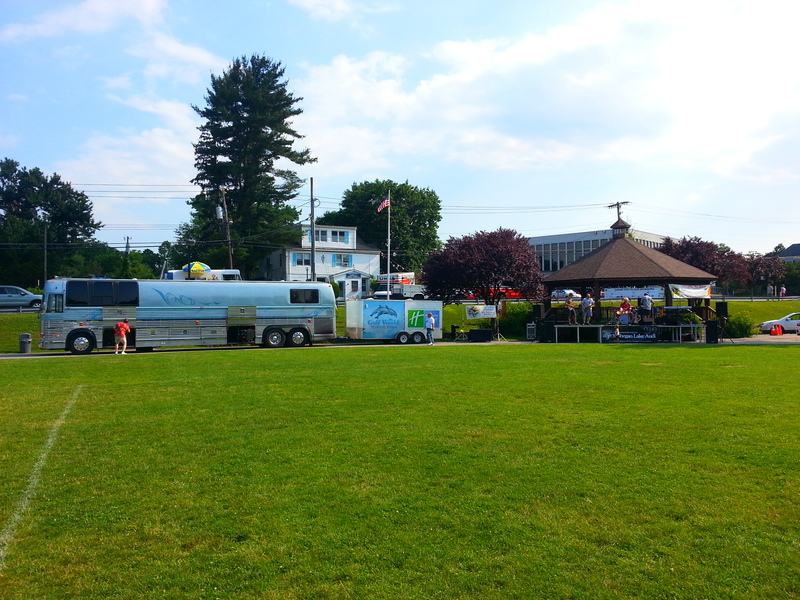 That wrapped up the July touring. Now we stay local on Panama City Beach, FL for a month or so. 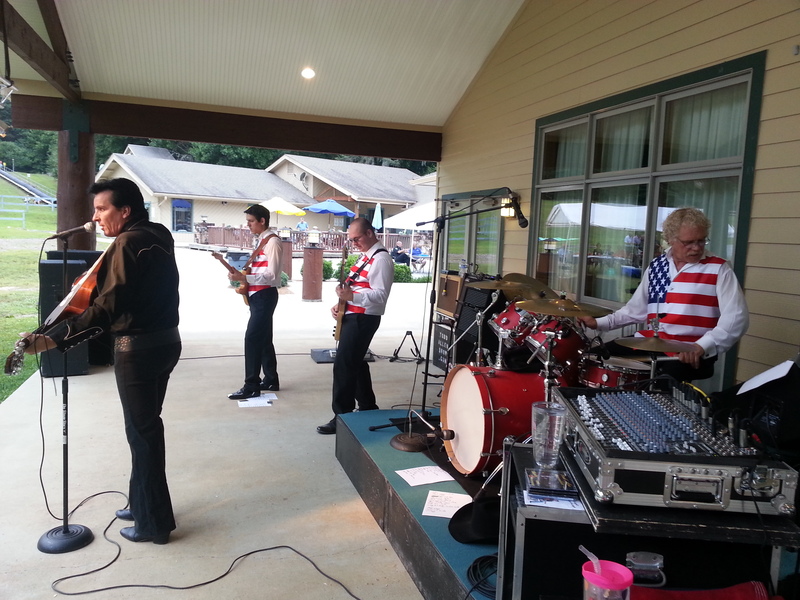 We perform every Thursday at Gulf World Marine Park at 7:30 pm. 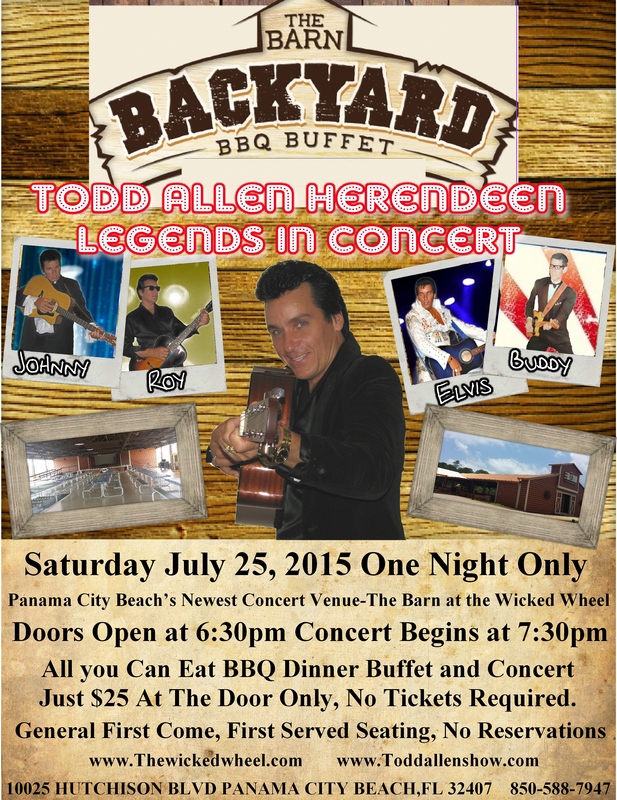 For ticket info call 850-234-5271. This is our 13th season at this beautiful theatre! Some of you may know on July 4 We lost one of my best friends my family and I ever had who was one of the owners of Gulf World. Brad Miller was one of the main reasons for my family coming to Panama City Beach and being successful. He was a successful businessman. He and I shared many many many laughs. We always said we never laughed as much with anyone else! He was also a Vietnam veteran. We will miss you Brad. Keep his wife Maryann and their family in your prayers! 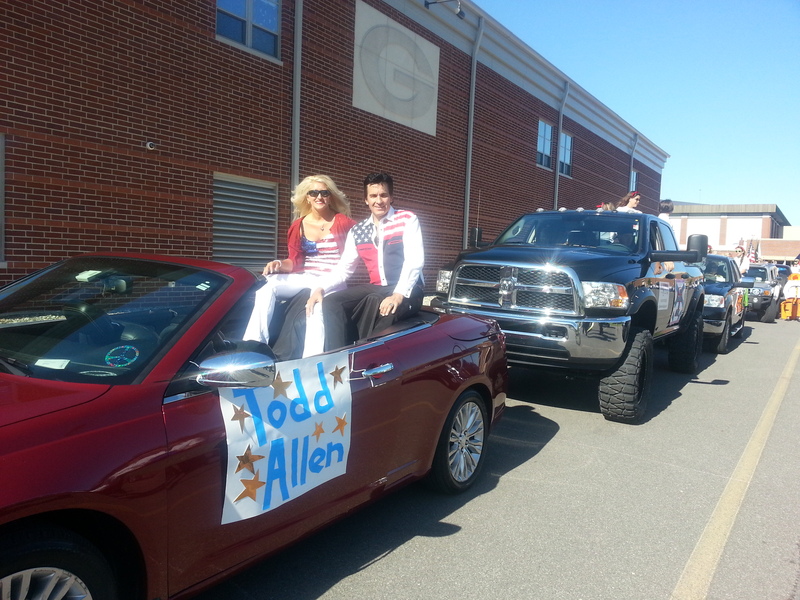 Check out our full schedule at http://www.toddallenshow.com. You can also purchase CD’s, DVD’s and more there! Our God and Country CD has all the music we do at our God and Country concerts 🙂 Hope to see you soon at a show! December Shows! Big one with Ray Walker Dec 13! We hope you all have a wonderful Thanksgiving! We are so blessed and Thankful for our God! We want to share our December schedule with you! We have some exciting Shows coming up for sure. 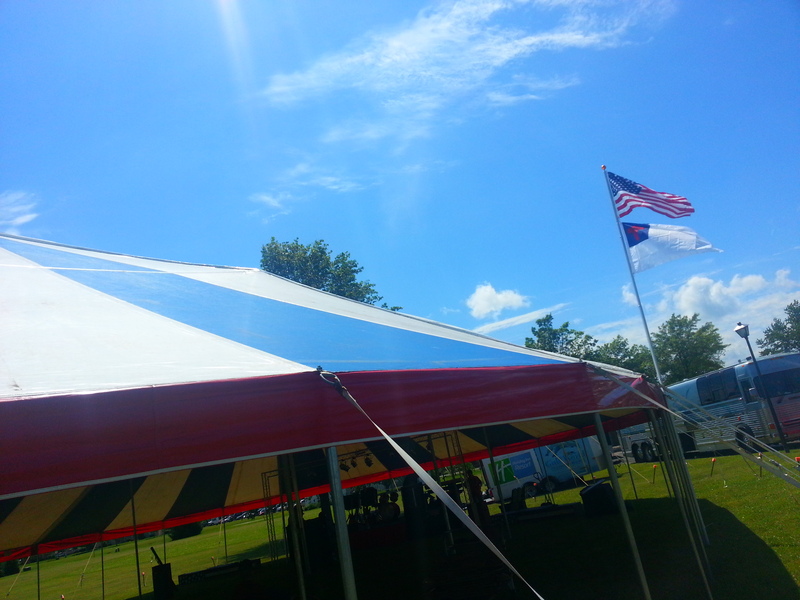 December 7 and 8 we are doing our first ever Two day Tent Revival of America in Hawkinsville, GA! Don’t worry we have sidewalls and heaters in case it’s chilly weather! Dec 7 at 2pm and Dec 8 at 3pm! www.tentrevivalofamerica.org . These events are free and we need your help telling folks about it. We have the poster on Facebook if you can share it, it would help us out! We honor each and every veteran and active service member present with a special certificate, so please invite all you can. 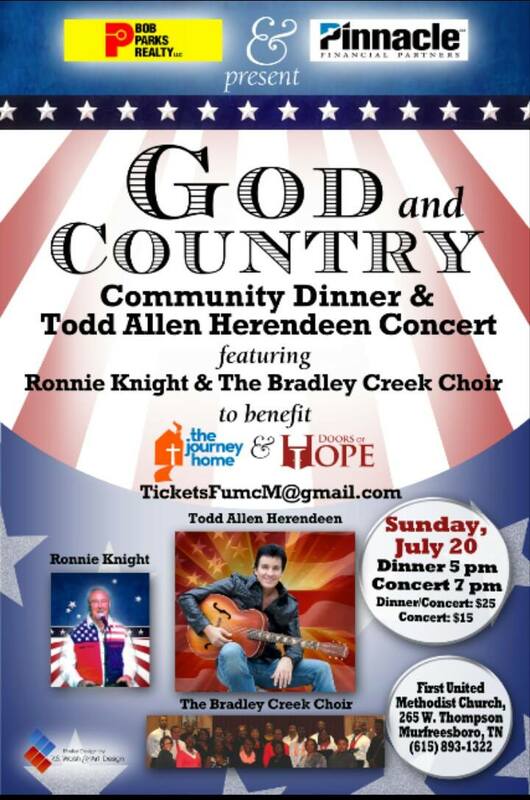 Local Ticket outlets (cash or check only) are: Kendallville Chamber of Commerce: 260-347-1554 or Paradise Buffet in Auburn, IN: 260-925-6966 or Rome City American Legion Post 381: 260-854-2477. Big thank you to our sponsors Holiday Inn Express in Auburn and The HAWK 95.5! You have a chance to win tickets everyday by listening to 95.5 the Hawk. December 20 $ 21 we will do our Legends Christmas Show in Panama City Beach, FL at our exciting new winter venue- The Boardwalk Beach Resort Convention Center! December 20 and 21 only! 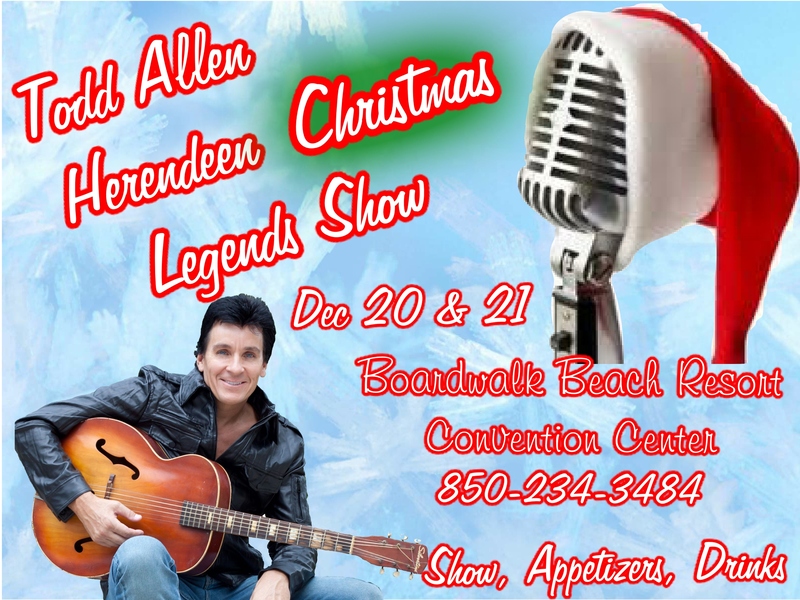 Two Christmas Legends Shows at The Boardwalk Beach Resort 9600 S Thomas Dr, Panama City Beach, FL 32408! Appetizers, Drinks and Show! Call 850-234-3484 for reservations. The Boardwalk Beach Resort will also be offering a low rate for rooms if anyone is coming from out of town and wants to stay! Call Boardwalk for more info. 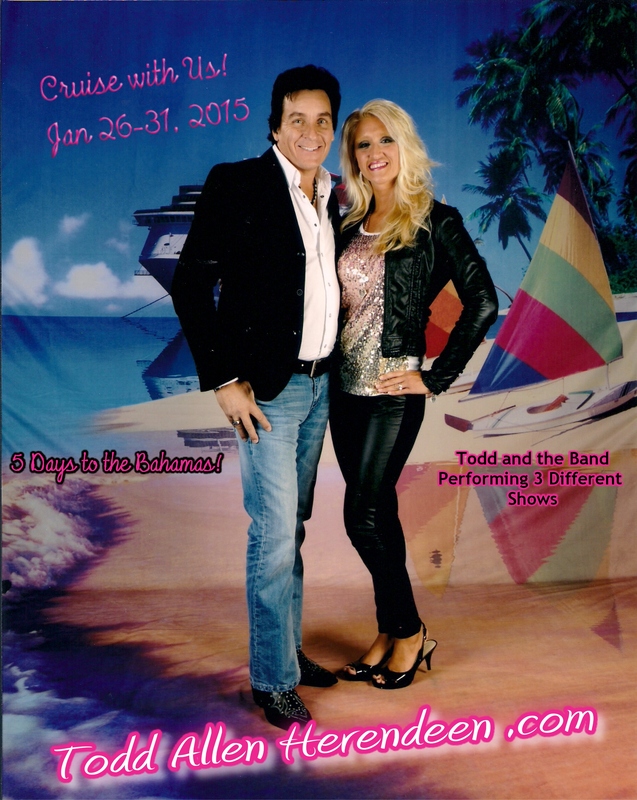 http://www.boardwalkbeachresort.com/ or www.toddallenshow.com. Shows will be our Tribute to the Legends two-part show with our favorite Christmas songs mixed in! We are excited! For More Details, Rates, Availability & Additional Info Call Toll Free 800.633.0266. http://www.hipcbeach.com. 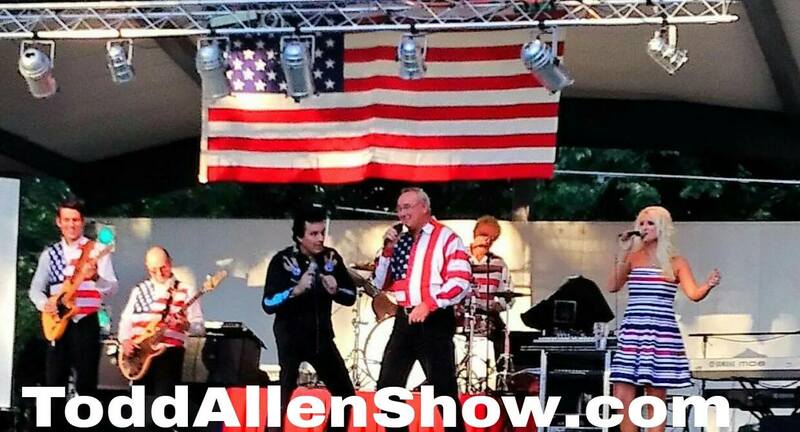 January 9 we head to Thomaston, GA for our annual Tribute to the King Birthday Bash. 706-647-5372 for info. Doors open at 6:45 pm and showtime is at 7:30pm. 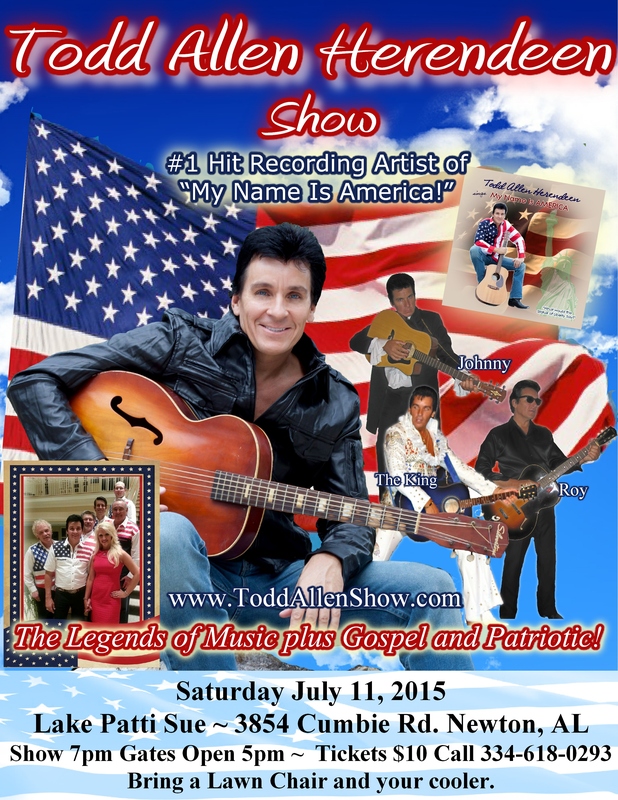 Tickets available at the theatre and at the Thomaston Upson Arts Council gallery as well. Be Blessed! Keep us in your prayers!